The Dem Party's two big cheeses have laughed it up with Dave, too. Note to readers: Barack Obama's winning performance on Monday's Late Show with David Letterman probably means that his arch rival for the Democratic presidential nomination will have to show up again in the near future. Hillary Rodham Clinton's first brush with Dave was a long time in coming, though. Return with us now to her maiden voyage, as recounted in a Jan. 13, 2000 review. Her long, national late night-mare is over. Ceaselessly lampooned and goaded by David Letterman, first lady Hillary Rodham Clinton finally appeared on his CBS Late Show Wednesday night. It was very, very good for both of them. Replendent in a black pantsuit, pink blouse and shimmering earrings and necklace, Mrs. Clinton defrosted any ice maiden image through the simple acts of laughing amiably and chatting naturally. Or so it seemed on camera, which is all that really matters. 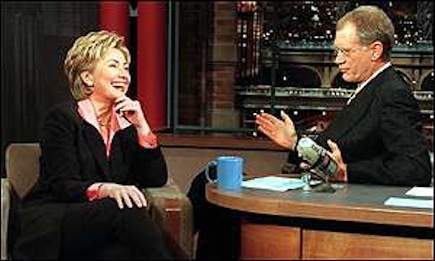 Letterman, in business to make his guests look good, broke the ice by telling viewers that he had seen Mrs. Clinton in the wings and that "she looks sensational." Suddenly it no longer seemed to matter that he regularly has derided her as a carpetbagger while dismissing her husband, the president of the United States, as "Tubby." Mrs. Clinton prepared herself well, both with scripted quips and a winning way of delivering them. She even made a modicum of news, telling Letterman emphatically, "I am going to run for the (U.S.) Senate. And I'm officially going to declare." When the host asked when, she replied, "Next month." The appearance was much more about perceptions, however. Principally, would Mrs. Clinton be able to banter with the same dexterity as some of Letterman's previous political guests, including Vice President Al Gore, Bob Dole, Dan Quayle and her future opponent, New York mayor Rudy Giuliani? Indisputably yes. And now the race is on. "I knew if I were going to run for the Senate, I had to come and sit in this chair and talk to the Big Guy," she said. Mrs. Clinton sealed the deal with a closing list of the "Top 10 reasons that I, Hillary Clinton, finally decided to appear on the Late Show." She drew big laughs with No. 8 ("If Dan Quayle did it, how hard could it be?") and twitted the host with No. 2 ("Um, I thought Johnny hosted the show"). But No. 1 was the clincher: "If I can make it here, I can make it anywhere." She has a long way to go to catch Giuliani, who has appeared on Late Show 19 times in various capacities. But this had all the earmarks of a great start, even if the lone low point came when Mrs. Clinton explained that being a senator is much different than being mayor. "A senator can't go arrest a homeless person," she then quipped. To which Letterman retorted, "That's not entirely fair." The moment quickly passed, however, and Mrs. Clinton soon was joking about the White House pets. She also deftly handled the host's six-question quiz about her new home, New York, correctly identifying the state bird and tree. Before Mrs. Clinton came onstage, Walter Cronkite made a surprise walk-on to remind Letterman that he would be conversing with the "first lady of our nation." Pause, one-two. "Try not to be jackass, willya?" He wasn't, she wasn't, and all involved must be feeling pretty good right now. For the record, retired pro football lineman Art Donovan followed the first lady as Letterman's second guest. The show must go on.